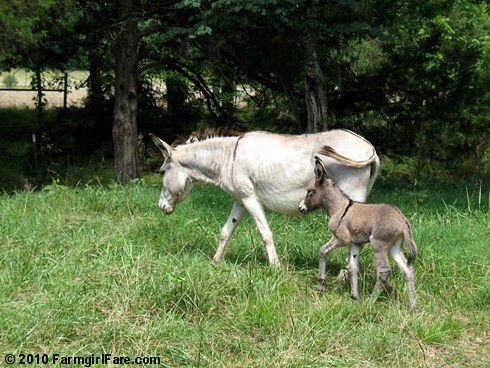 We have a new baby donkey! 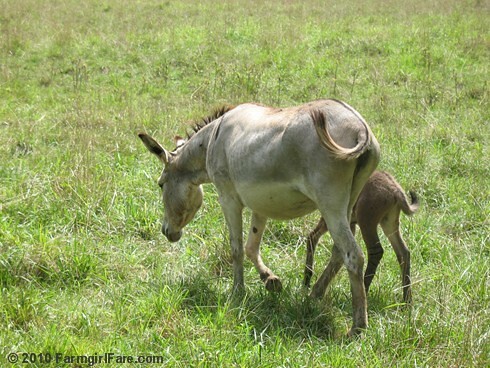 On Tuesday, with no help from us (and without our being anywhere around—which is how donkey moms seem to prefer things), four-year-old Daphne gave birth to this darling little donkey. It wants nothing to do with me yet, and of course all I want to do is scoop all that softness up in my arms and snuggle the heck out it. It's no wonder mama Daphne is being so protective. After what happened with baby Flitta last fall right after I introduced you to her—as well as everything that's been going on around here lately—I've been a little hesitant to announce our new long-eared arrival and share these photos I took on Wednesday morning, but so far, so good. It's nursing just fine and has lots of energy. 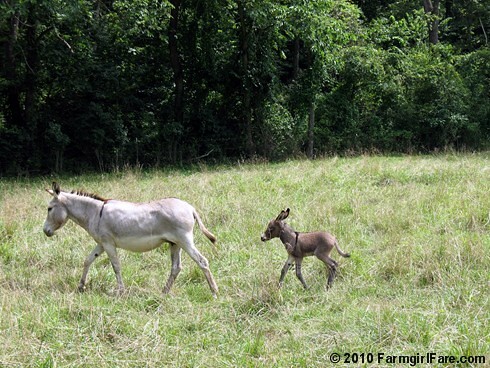 I've only been out to see it once (I'm still mostly shackbound, especially after overdoing it a couple of days this week), but Joe says that every time he goes out there, the baby is running around the field so fast that none of the donkettes can even keep up with it. That definitely sounds like it's Evie's sibling—her name is actually short for Evinrude because she used to race around in circles when she was a baby, starting about five minutes after she was born. At two years old, Evie is still a kid herself, and I'm sure she'll be joining in the fun real soon. 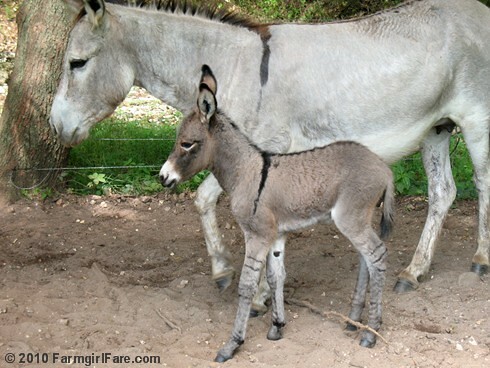 This baby donkey has special markings that none of the others did: there are thin dark bands around each leg, almost like bracelets (you can see them best in the fifth photo down). It'll be interesting to see if they fade away or not. Neither of us has been able get close enough yet to tell if the new donkey is a boy or a girl. A girl would be very good news indeed, because then I'll get to keep it. (Donkey Doodle Daddy is more than enough jack for this farm—and in fact we're planning to de-jack him soon so our donkey herd can stop multiplying and he can go back to running with the group.) I keep thinking it's a girl, but I've been wrong before. Please. Please. Please. Please be a girl. © 2010 FarmgirlFare.com, the going against the flow foodie farm blog where it's hotter than blazes outside (108° heat index predicted tomorrow), so are we outside grilling dinner like we do most nights year round (even in the snow)? Of course not! We're in the kitchen slow cooking a couple of lamb shoulder roasts in the dutch oven all afternoon instead. Yes, obviously we need to get out of the flow (no matter what direction it's going), dunk our heads in a bucket of cold water, and get the tempermental gas grill fixed so we can keep the dinner heat outside like smart people. Just one more good reason we don't have any neighbors keeping an eye on us. P.S. It was delicious. Cute! I'm glad you have some happy news. what a cutie! i hope you get a snuggle session soon and i really hope it is a girl! What a doll..! Just beautiful. What a special place to come stay for a while it chose, no? I think so. 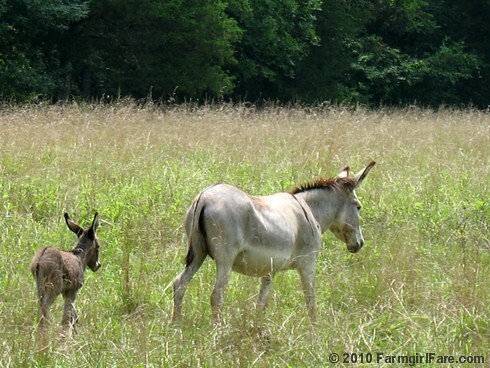 It made me smile to think of this perfect little donkey running around at the farm, Susan. I hope you're slowly feeling better, dear. I'll be thinking of you. This little one even looks hardier than poor little Flitta ever did in the pictures. Hope you find out soon it is a donkette and the markings don't fade out! I just love the ears. How are you doing? Will it be much longer before you are back to normal? And how about your husband? So, so cute! I hope it's a girl so you can keep her! Wonderful photos! Hope you feel better soon and that the weather cools off for you. Congratulations on your new addition! 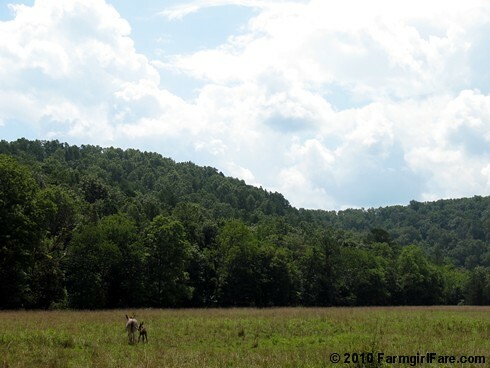 I have been wondering if the donkeys do any work on your farm? Do they haul stuff or do you ride them? What else do donkeys do? I noticed those markings & thought, "It looks a little like that Zebra-Donkey mix that was born in Georgia recently!" Congrats on the new baby & I hope you continue to take it easy. Or, take it as easy as you can on a farm. Yes, like Shadow said -- looks like SHE is part zebra. And I'm sure she is a she! Don't see any hangie-down parts in any of the pictures. Good luck. Congrats!! to all!!! 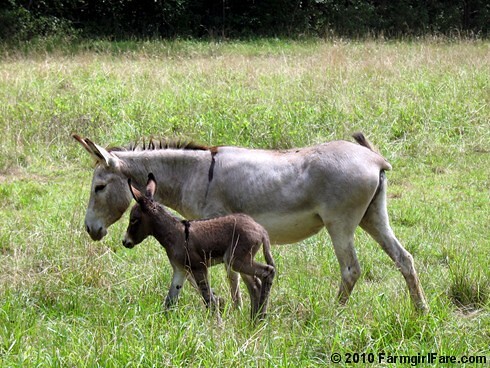 I never realized how adorable donkeys were until I found your site - and now I'm in love!! I'm really happy for you and you more than deserve some 'good stuff' to happen to you and Joe and the farm!! Thanks, too, for the update on the other donkeys and where they are these days. Welcome to the new baby!! 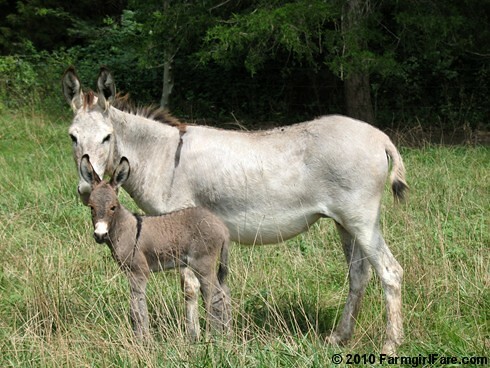 I, too, immediately thought of the Zee-Donk who was born recently at the Chestatee Wildlife Refuge in GA. Pictures are so similar. Congrats to Dan for me, too! Sure hope you are beginning to feel back to normal after your recent encounter with the snake. That was a pretty frightening story. Keep those donkey pictures coming our way! Even if it turns out to be a boy, if you geld him soon enough - he'll probably never know that he was a boy. He'll just be an IT as I call them sometimes. 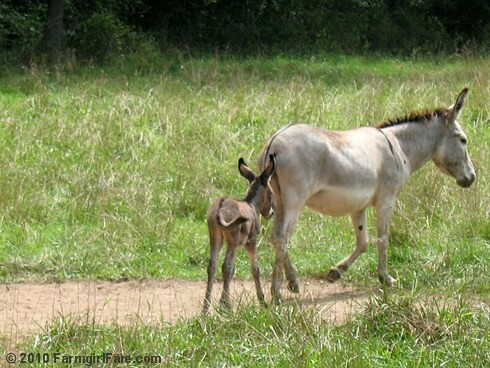 Your photographs capture Mama and Baby Donkey's personalities beautifully. Hope you continue feel better and regain your stamina! love the cute cute donkey, and all it's unique markings! it sounds like you're starting to feel a little better - I hope so! Wow, I think baby donkey pics might trump calves in the cuteness front. I think our donkey Lucy is past breeding age, as far as we know she's about 50. Have you figured out the gender yet? Monday Dose of Cute: Up 'n' At 'Em! Thursday Dose of Cute: First Corn of the Season!